Because Charlie Sheen took his father's stage name when he began his career as an actor (unlike his brothers and sister), people sometimes forget that he is actually of Spanish decent. Born Carlos Irwin Estévez, the Anger Management star has been credited as "Charlie Sheen" ever since he starred as Matt in 1984's Red Dawn. 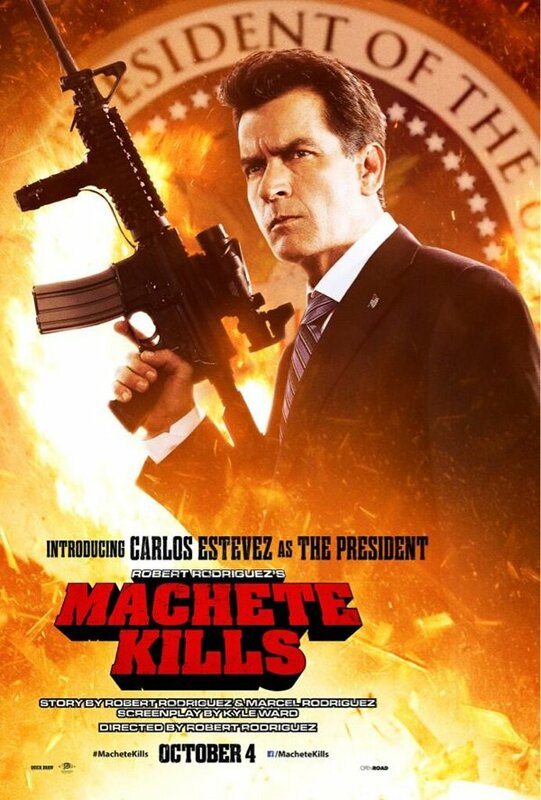 But now that he's teeming up with Latin-and-proud filmmaker Robert Rodriguez, Sheen is set to let his inner Spaniard out...and it starts with this brand new character poster from Machete Kills (which comes to us via Rodriguez's Twitter feed). First announced to be part of the cast back in June of last year, "Estevez" will be playing the President of the United States in the upcoming Grindhouse thriller, which sees Danny Trejo return in the title role. The film sees the President and Machete forge an alliance in order to stop a psychotic weapons dealer (Mel Gibson) from launching a missile into space. Unfortunately, those of you who are excited for the movie will have to wait a little longer to see it. Last month we reported that Machete Kills was moving from its original release date on September 13th to October 4th - taking over the spot vacated by Rodriguez's Sin City: A Dame To Kill For, which was recently pushed back to 2014. While most movies tend to release character posters in bunches, Rodriguez has actually been pushing them out at random times over the last year or so, starting with Lady Gaga as La Chameleon in July 2012. Other posters have included Sofia Vergara as Desdemona, and Michelle Rodriguez who returns as She. You can see all of the previously released designs below as well as the trailer that arrived online in May (just ignore the release dates). 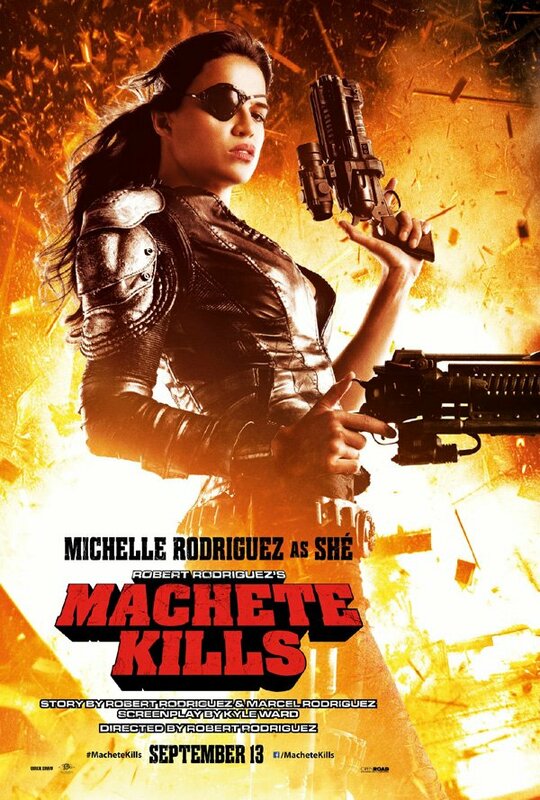 Thanks to the film's fantastic supporting cast, it wouldn't be too hard for Rodriguez to keep pumping out these character posters between now Machete Kills' release date. In addition to "Estevez," Gaga, Vergara and Rodriguez you also have Trejo, Gibson, Amber Heard, Antonio Banderas, Jessica Alba, Demian Bichir, Alexa Vega, Vanessa Hudgens, Cuba Gooding, Jr., and William Sadler as possible candidates for one sheets. Then again, after The Beaver's lack of success at the box office back in 2011 maybe it would be best to keep Gibson out of the marketing as much as possible.